We already know that there's a brand new Pokemon Switch RPG coming some time this year, but it looks like today might be the day that it's finally revealed. Yesterday, The Pokemon Company revealed it would host a Pokemon Direct to celebrate Pokemon Day. Thanks to the above teaser with the classic trio of Pokeballs to signify picking one of three starter Pokemon, everyone believes that it's going to be the reveal of the next game, and the brand new Gen 8 Pokemon. If you're wondering how to watch the Pokemon Direct, you can actually watch it right here, via the official Pokemon YouTube channel. 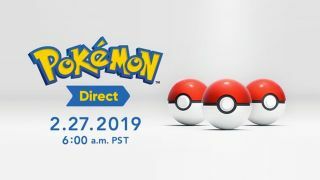 interestingly, the Pokemon Direct will only last seven minutes, which means you can expect a jam-packed announcement, complete with what should be the first ever gameplay footage of Pokemon Switch, and hopefully the reveal of the game name. Pokemon has promised it will reveal "new information" that fans won't "want to miss". It's also significant that it's Pokemon Day - February 2 was the day that the original Pokemon Red and Blue debuted in Japan. It's going to be exciting. All we know about the next core Pokemon game so far is that it's coming in the second half of 2019, so we're more than due some more news.